National Eucalypt Day is held on 23rd March in Australia. It’s all about celebrating and raising awareness of these fabulous plants. The diversity and adaptations of eucalypts are fascinating, producing the most amazing array of leaf form, flowers and seedpods. 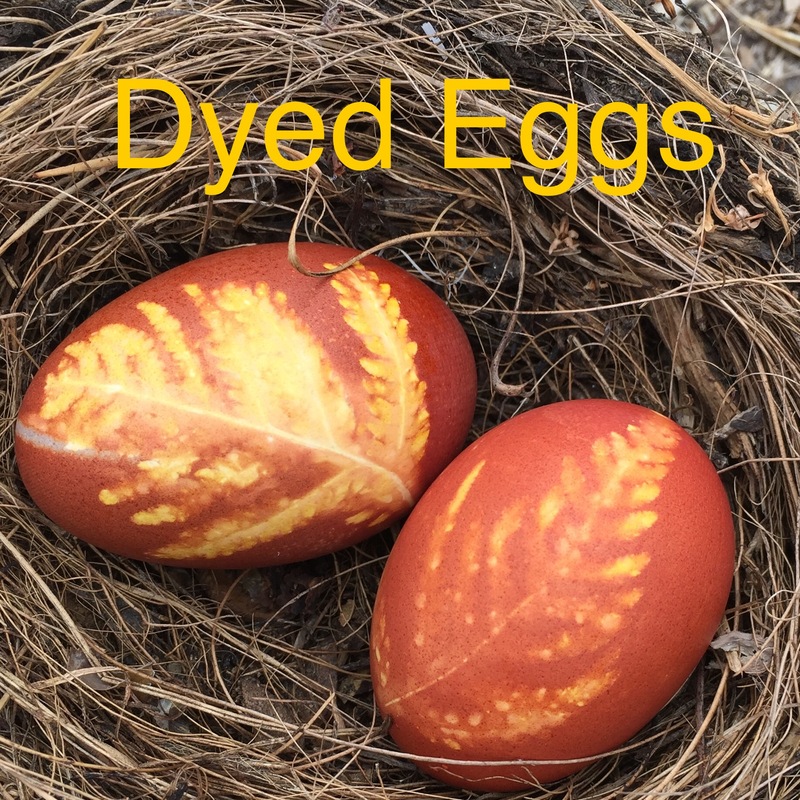 And importantly, their leaves, seedpods and caps are fabulous for crafting! For more information about National Eucalypt Day, go to Eucalypt Australia. More research has been released to back up the view that nature is good for us. If you’re reading this you, probably already agree! Please support Aussie growers in their time of need, and have fun at the same time! 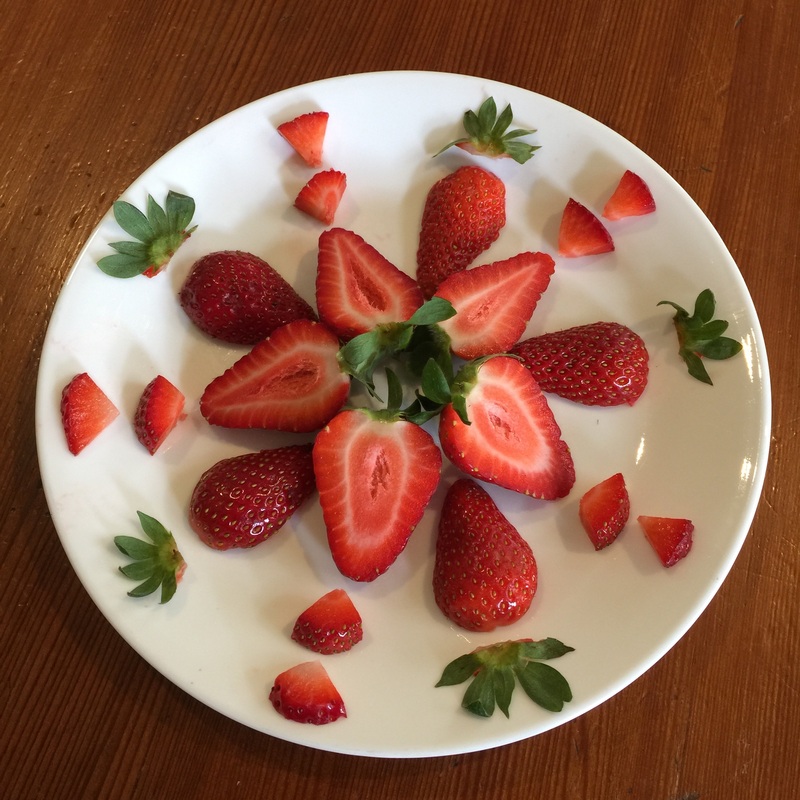 Cut up your strawberries and make a strawberry mandala before eating them. Get creative and see what else you can make, take a photo, then eat them! Yum! And if you need more strawberry inspiration, here’s a link to a cool Youtube clip about how to make more carved strawberry decorations. Enjoy! Crafting is good for us! Great research is coming in proving what any crafter already knows, crafting is good for us ! So make sure you make time for crafting, whether it be knitting, sewing, woodwork, or macrame. For extra added benefits, craft with nature! The materials are inspiring and beautiful to work with, and readily available for free. For more interesting articles check out my Useful Links. 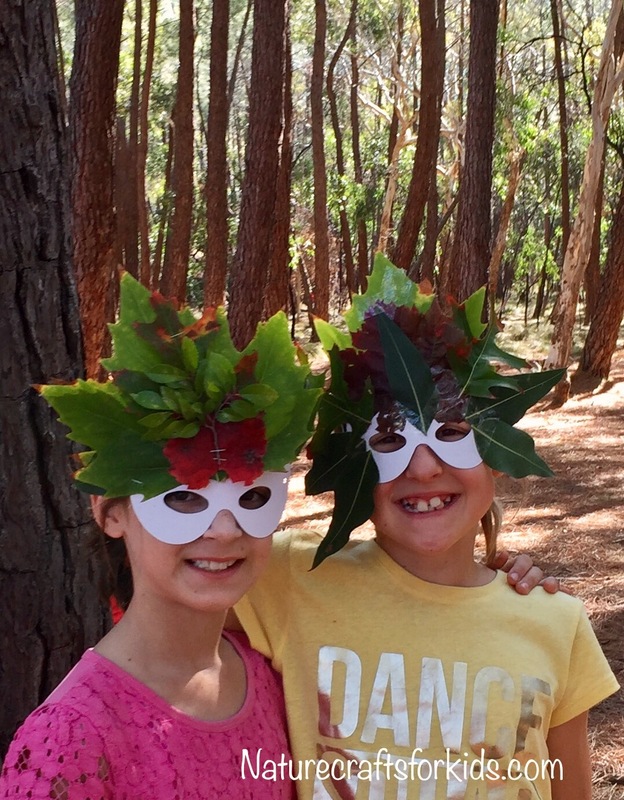 Had a fabulous time running the nature mask craft activity at NaturePlay SA’s Forest Festival. Families gathered at Kuitpo Forest, just outside of Adelaide, for 2 days of playing, relaxing, exploring and fun in the forest. Orienteering, potion making, low ropes, and cubby building, kite flying and the nature masks were enjoyed by all. The nature masks were made from pre-cut cardboard, with an elastic tie. Children (and parents!) used sticky tape or staples to attach colourful autumn leaves, sticks and feathers. Each mask was its own unique and beautiful design! 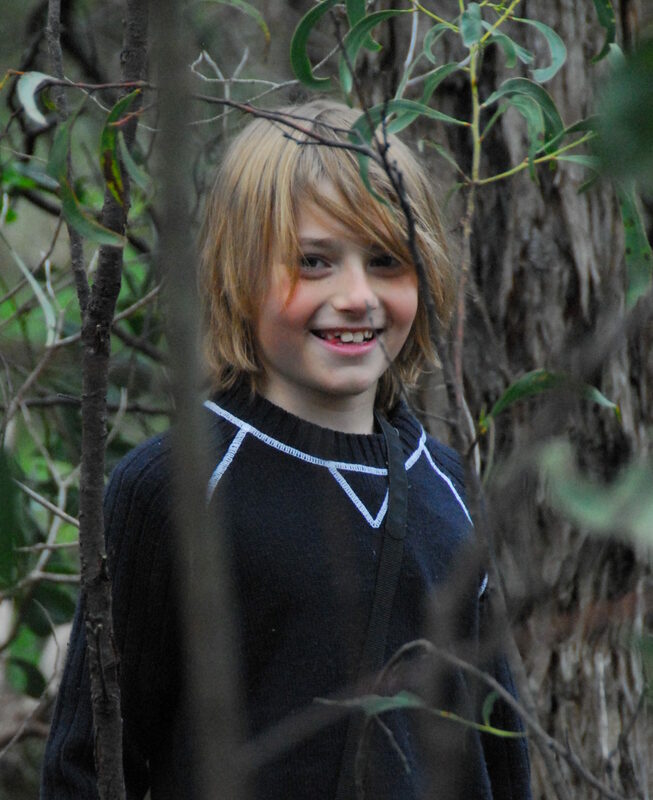 It was a wonderful Easter Saturday at Sophie’s Patch in the Adelaide Hills making autumn leaf crowns with the kids. 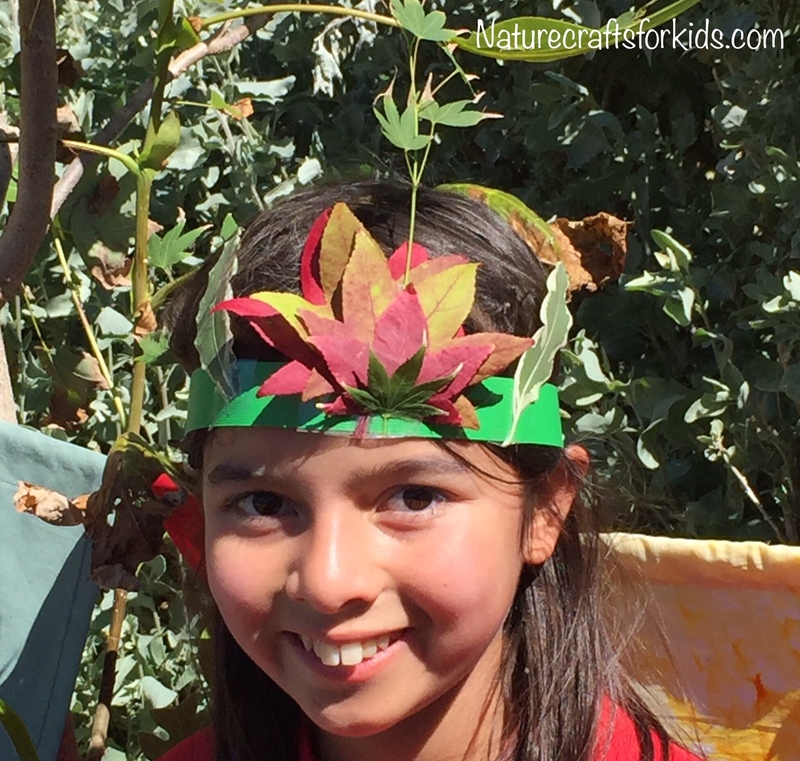 Early in the morning I collected baskets of colourful maple, oak, elm and pear leaves, and the visiting children carefully arranged and stuck the leaves onto strips of cardboard to make their own unique nature crowns. They looked gorgeous and were worn proudly as the kids explored and played in the garden. Sophie’s special guest at the open garden was Gardening Australia’s amazing Costa Georgiadis who gave three inspiring talks. Costa the Garden Gnome appeared at lunch time to teach the children a chicken dance! Sophie’s garden is at Mt Barker Springs in the Adelaide Hills. It’s a wonderful example of a child-friendly, Mediterranean climate garden which is both attractive and productive. If you haven’t had the pleasure of visiting, check it out on this video below which Costa took on the morning of the open garden. I pop in near the end! Looking for cheap and easy Mothers Day craft ideas? 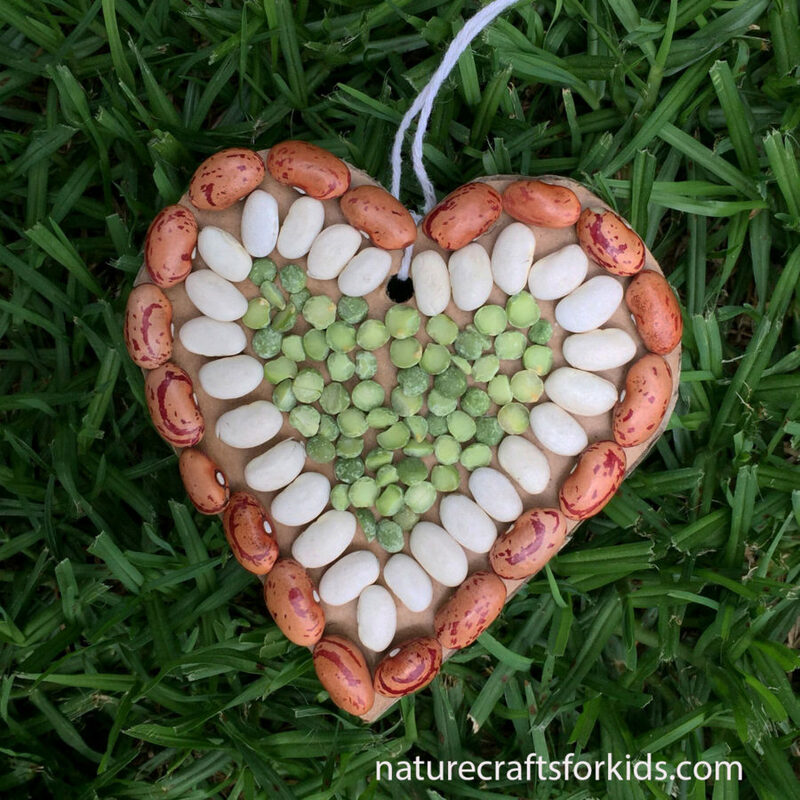 A seed mosaic heart is a fun and relaxing activity for all ages! If you’re working with a large group of kids, first create a heart shaped template. The kids then trace around the template onto cardboard from old cardboard boxes. They cut out the heart with scissors, and make a hole at the top with a hole punch. An assortment of colourful seeds (beans, peas, rice, lentils etc.) can then be glued on with PVA glue to make a pattern. This is a great use for seeds which are past their use-by date, or weevil infected. Once dry, a piece of string or ribbon can be tied through the hole so the heart can be hung. 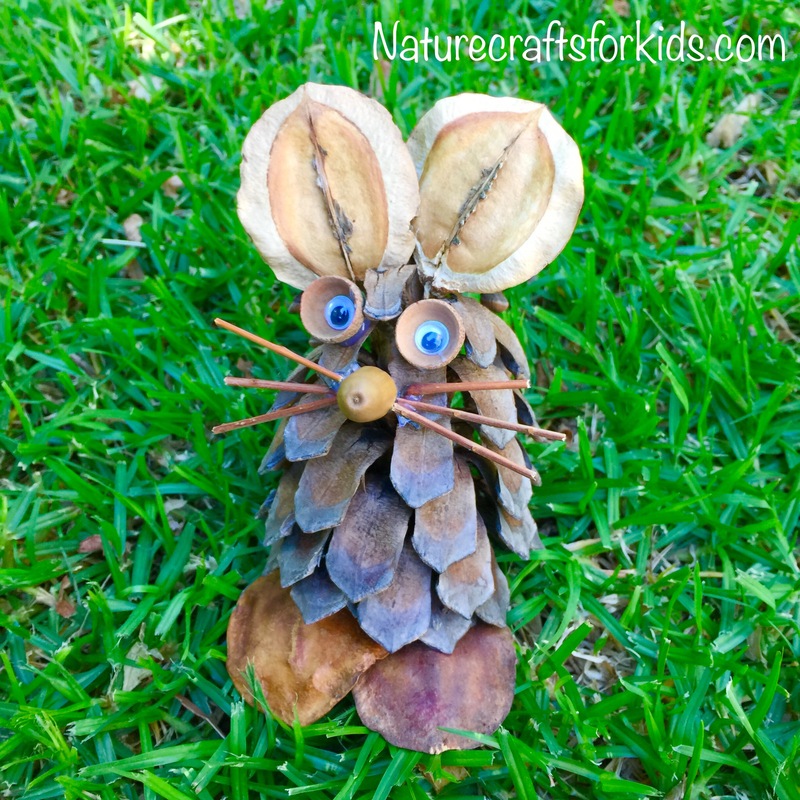 This is a fun, inexpensive, nature craft activity for a whole class. It is also a great way to start a conversation about the diversity of seeds, and can lead to discussion about the need to preserve heirloom seeds. For more information check out the The Seed Savers Network. 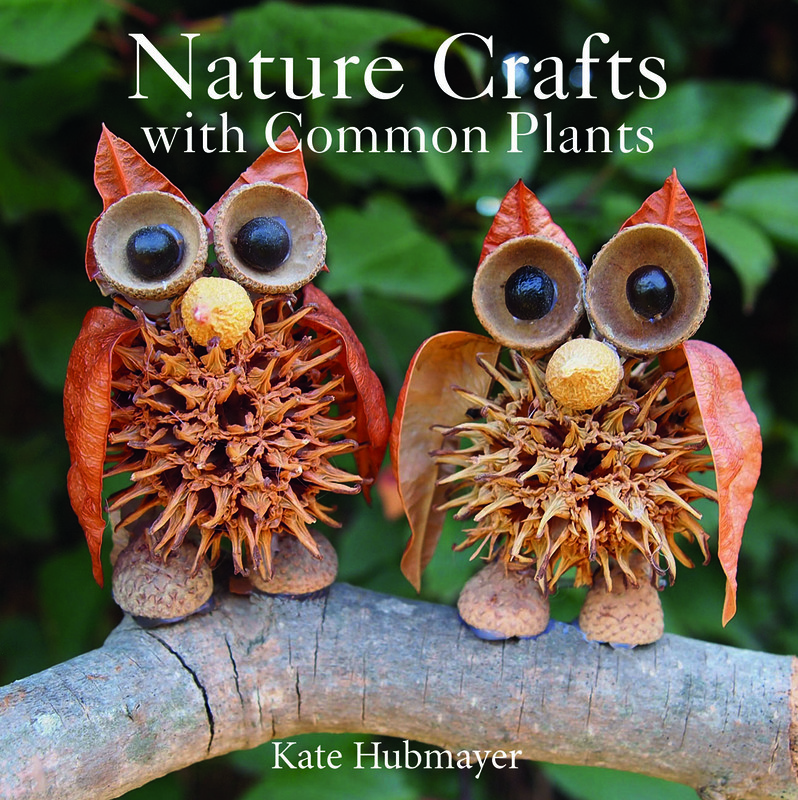 More examples of seed mosaics can be found on page 14 of my book Nature Crafts with Common Plants. Find a large pinecone to use for the body. And a bunch of Jacaranda pods. 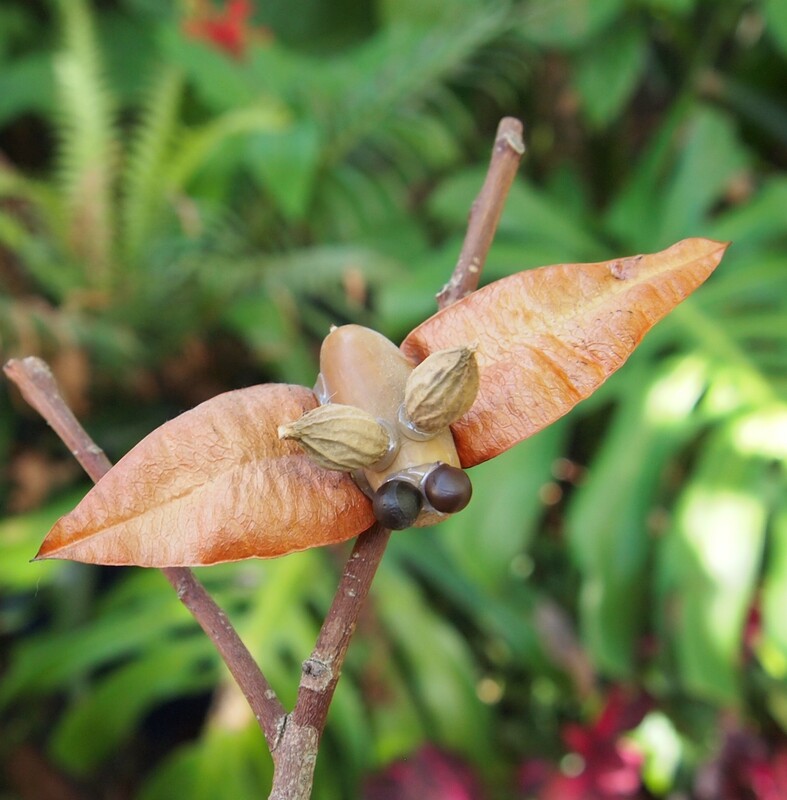 Jacarandas are commonly found in many cities, and their weird, woody pods are great for crafting! 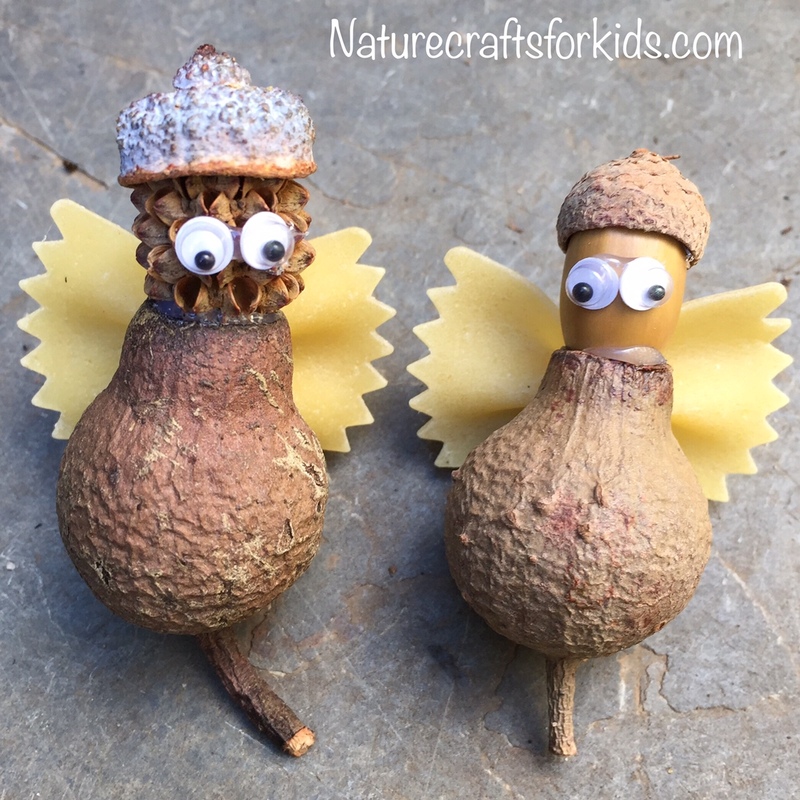 Find a couple of acorns and acorn caps to use as eyes. And a stick for the tail. 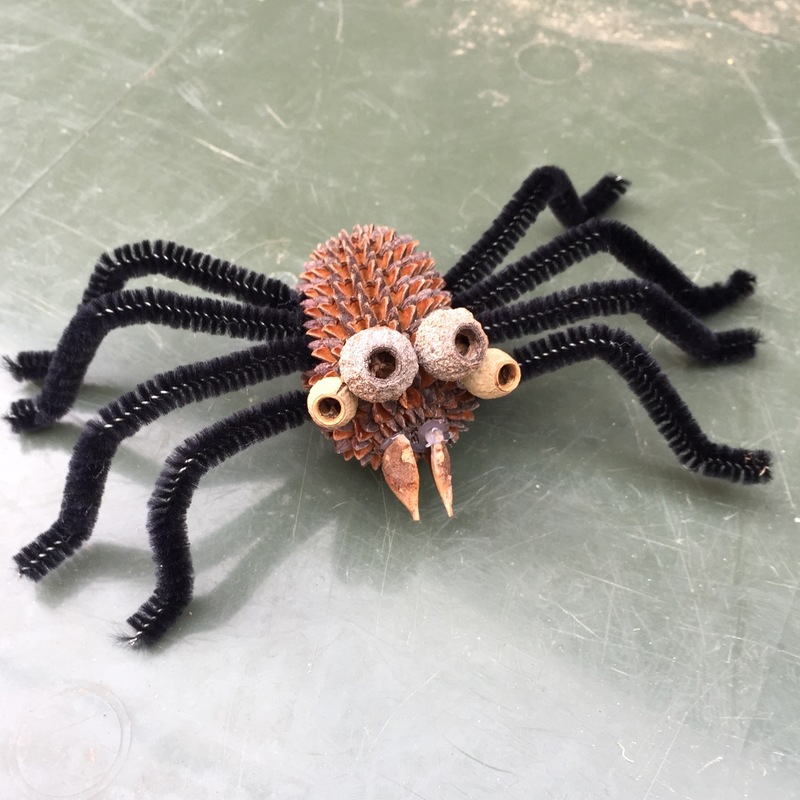 The legs can be made using acorns, small gumnuts, or small sticks – whatever you can find. Use a low-melt glue gun to attach the pieces together. (Don’t touch the hot glue!) 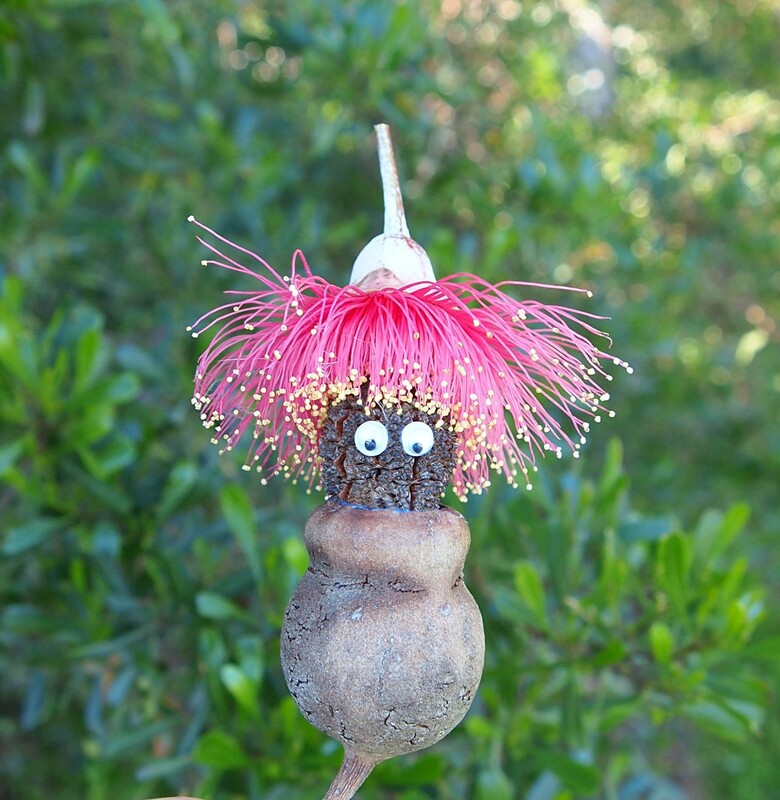 Glue two acorns into their caps and stick them onto a Jacaranda pod head. 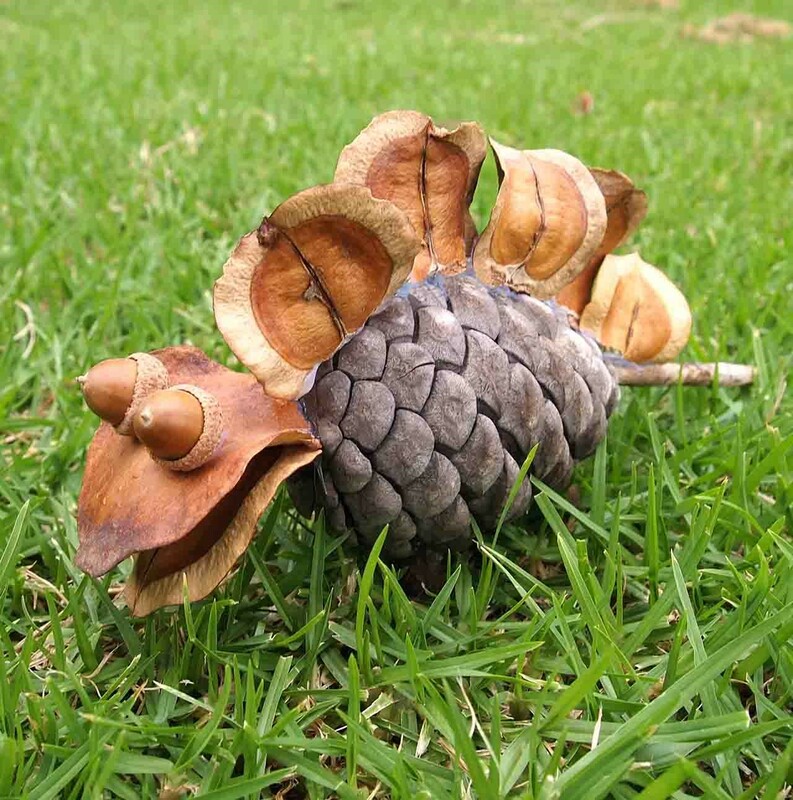 Attach the head to the pinecone body, then break some of the Jacaranda pods in half and attach them along the body. Glue on the stick as a tail and attach four legs. Take it outside and listen to it ROAR!!! Maybe it needs you to make it a friend?! Drip sand castles are a fabulous beach activity for all ages. 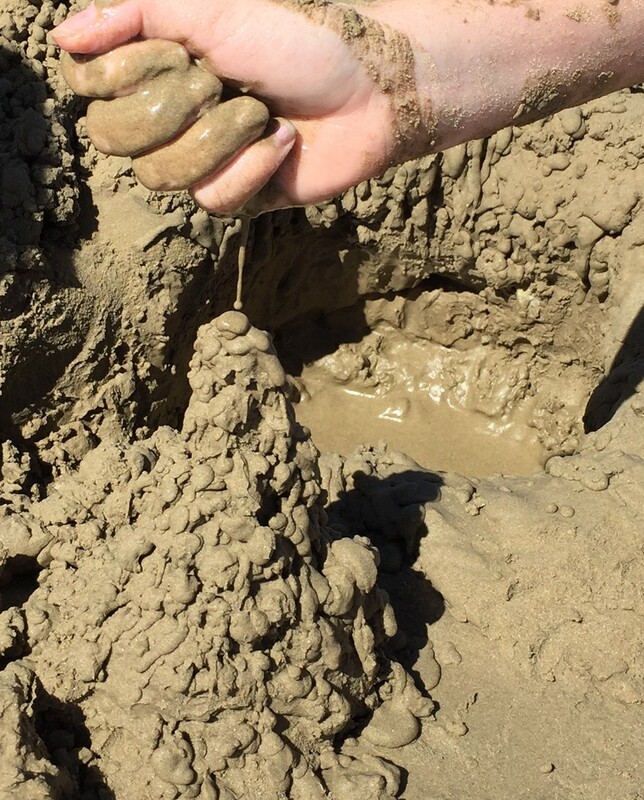 Just dig a hole in the sand until you reach water, then pick up some really wet sand out of the hole using your hand and drip it in a pile to create a castle. They look like amazing sandy stalagmites! See how tall you can build one, or make one with lots of towers. I think they have a rather gothic look to them. Check out some very cool, gravity defying drip castles by clicking here. 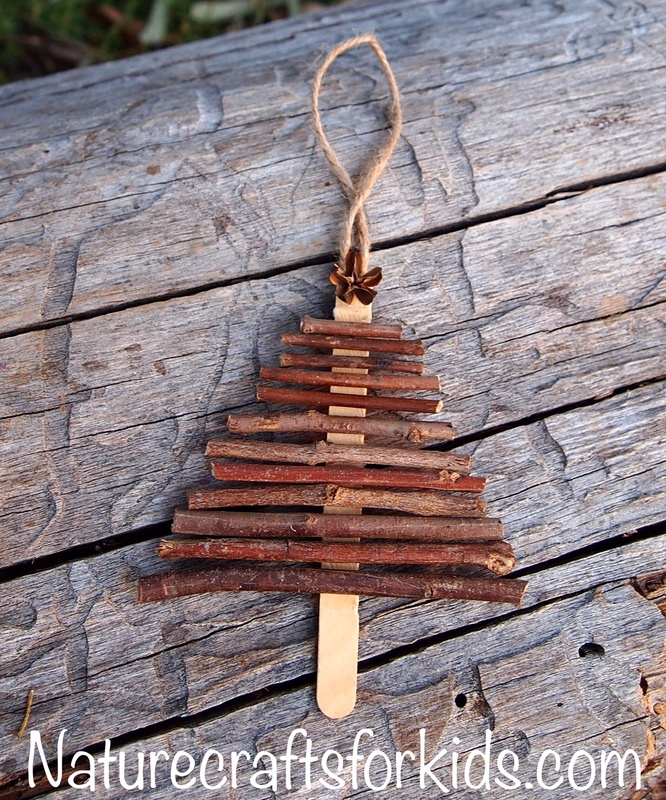 This little twig Christmas Tree craft is featured in my book, Nature Crafts with Common Plants. It’s a really simple but fun (& cheap!) 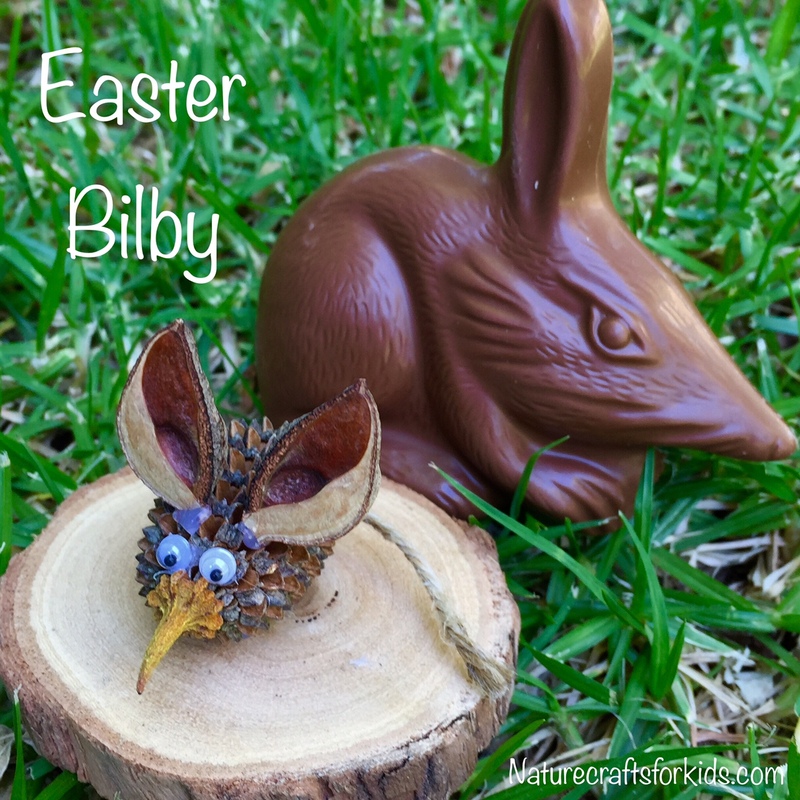 craft to do with a class or group of kids, or your own child. The trunk of the tree is a pop stick and I’ve collected some different sized twigs to use for branches. While you could use a larger twig as the trunk, the flatness of a pop stick makes it easier to stick the twig branches on. PVA or any other craft glue works fine. I’ve added a string so it can be hung up, and I’ve glued on a Crepe Myrtle pod as a star on top. It was great hearing about research into the effects of nature based therapy, at the Therapeutic Landscapes Conference in Adelaide recently. There is now clear evidence to support the belief that spending time in the natural world is good for mental health and well being. 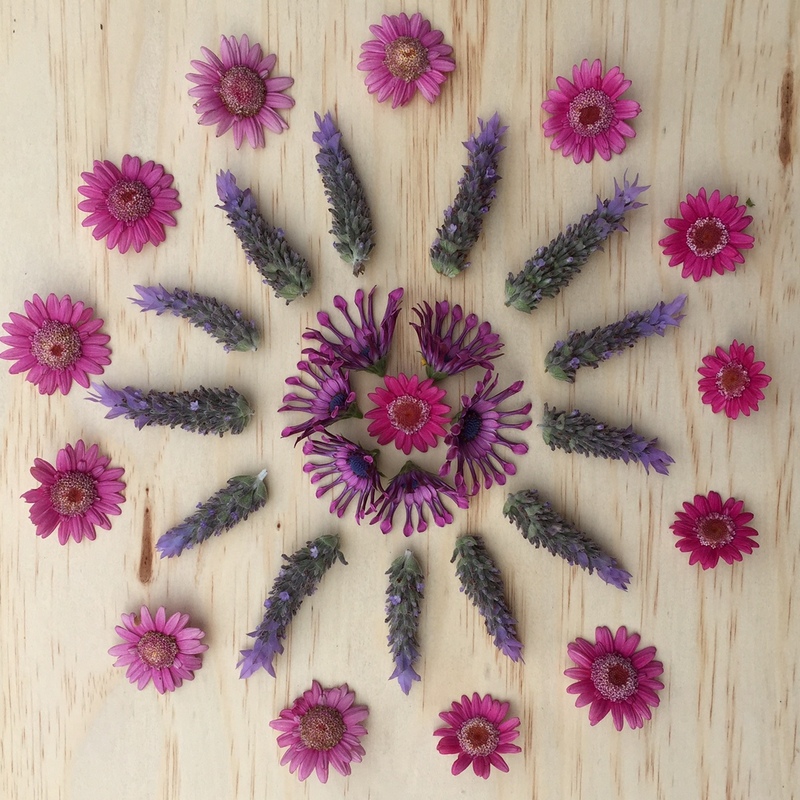 Indoor nature crafts are a way of bringing the therapeutic benefits of nature to people who are unable to spend time outside. 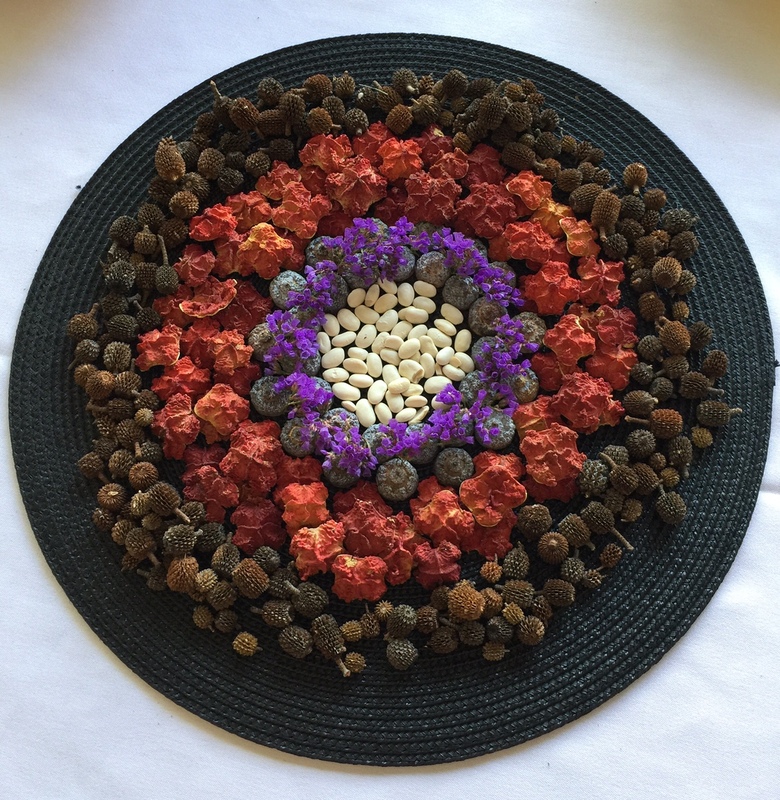 The meditative and relaxing process of arranging an assortment of seeds and other natural objects into a mandala pattern is wonderful therapy. The simple act of handling a variety of natural materials gives multiple sensory benefits. Creating a collage on paper using fresh flowers and glue is another easy nature craft enjoyed by people of all ages. The natural materials were arranged in a pattern on a circular mat, a photo was taken when complete, then the artwork was disassembled so the materials could be reused. 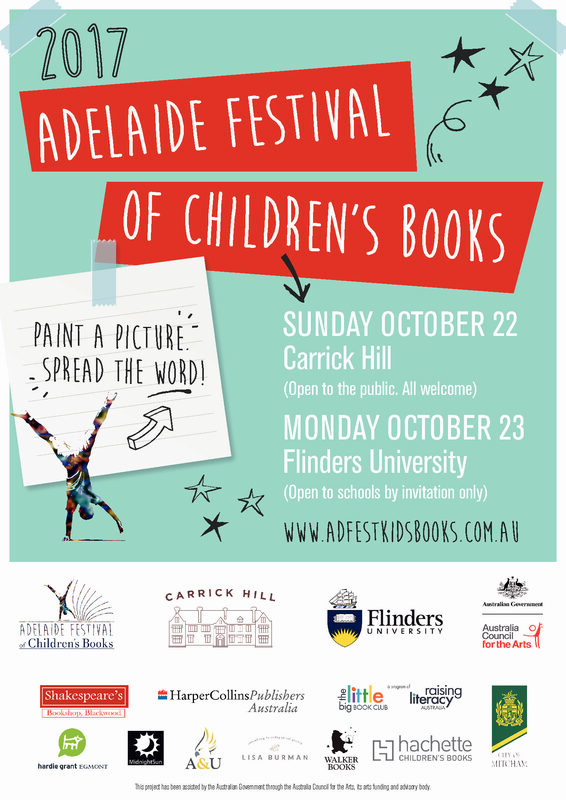 I’m excited to be part of the inaugural Festival of Children’s Books in Adelaide this October! It will be in the beautiful grounds of historic Carrick Hill. 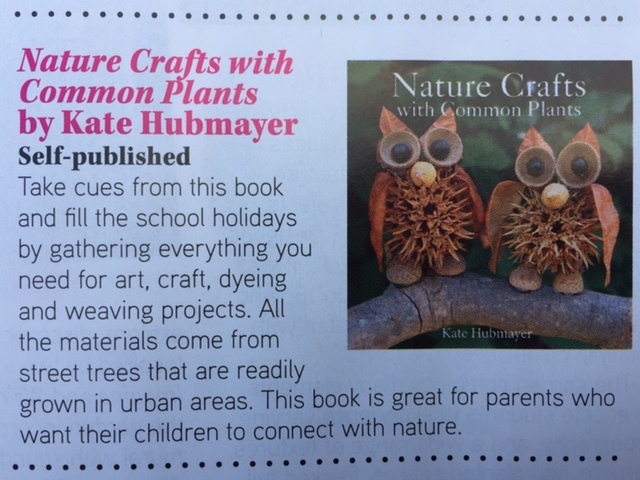 I’ll be hosting a nature craft activity, there will be a variety of author talks, and heaps of books for sale from Shakespeares Bookshop. 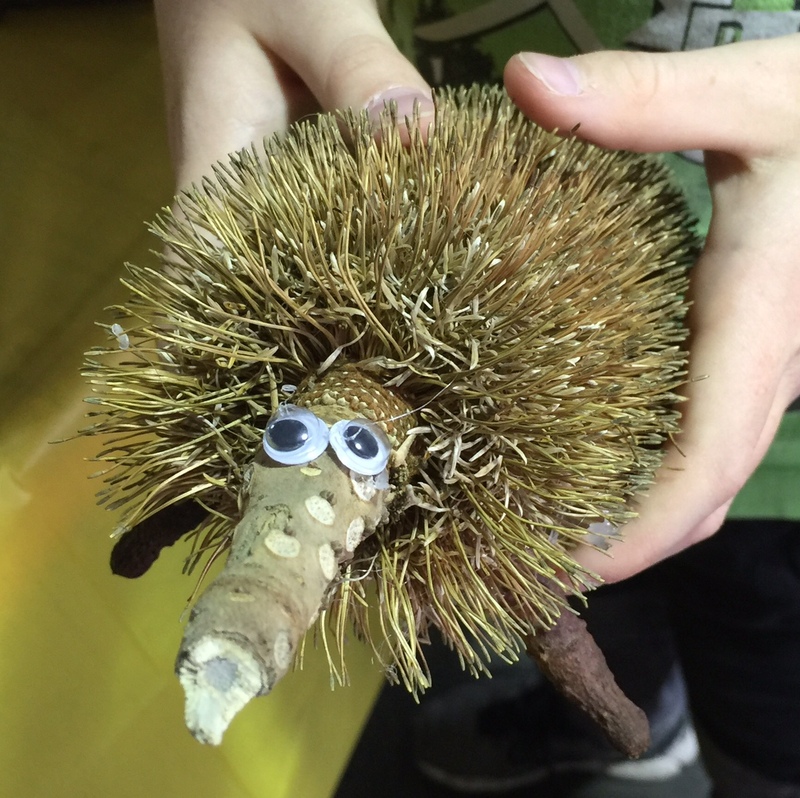 This gorgeous echidna was made by a 9 year old boy named Charlie. It’s body is a beautiful big dried banksia flower. I met Charlie and lots of other lovely kids and families at my local Australian Plants Society sale in Adelaide over the weekend. 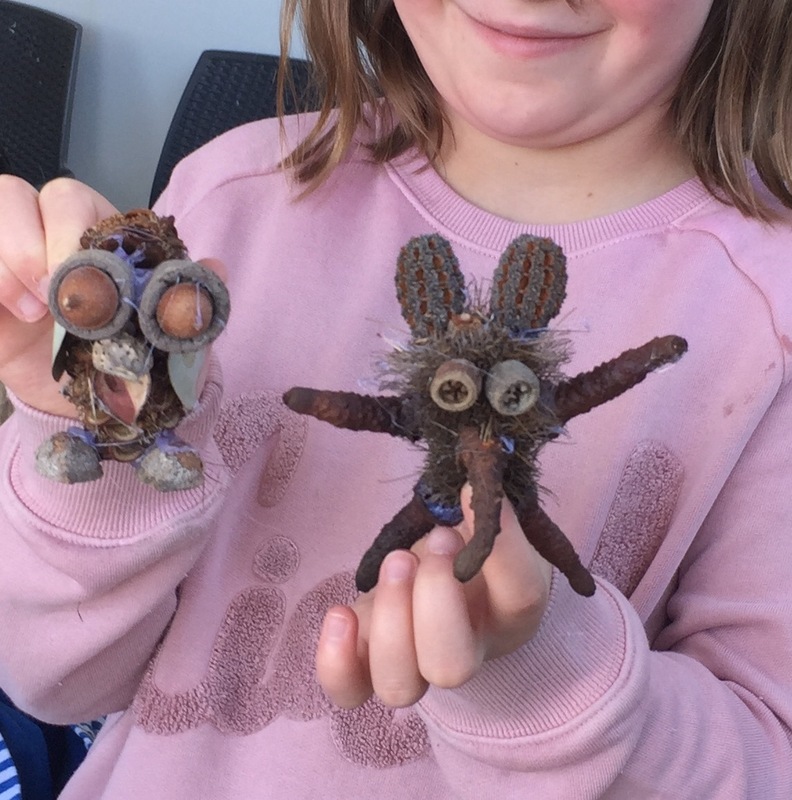 We had loads of native seedpods to choose from, and it was fabulous to see so many children (and some adults!) completely engaged with creating their own unique seedpod critters using their imaginations and a trusty low-melt glue gun! Head outside, collect some bits and pieces and have a go yourself! Not sure what this is! Winter in Australia is brightened by our amazing range of flowering wattles. Kids (and adults!) 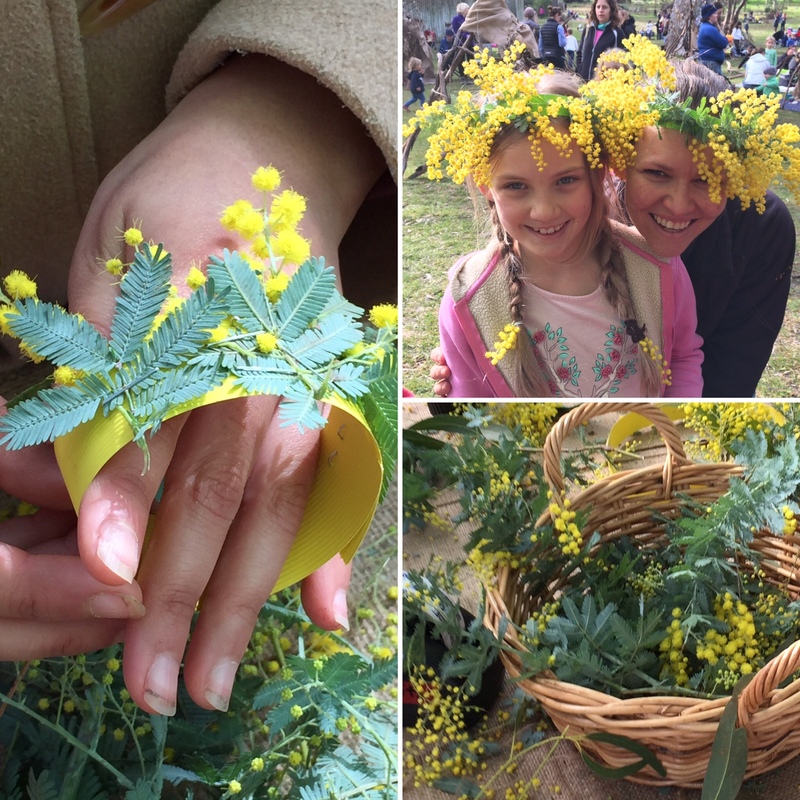 just love making wattle crowns and bracelets, and it’s so easy to do. Just staple a strip of cardboard to make a crown or bracelet, and attach the wattle with sticky tape or staples. 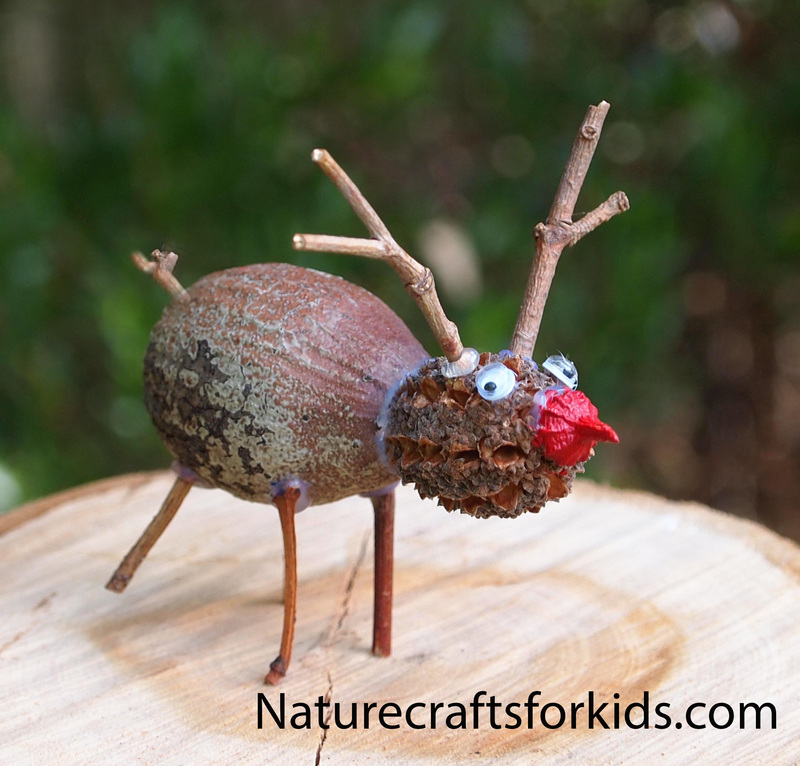 A beautiful winter nature craft! The Golden Wattle, Acacia pycnantha, became the Australian floral emblem in 1988, and wattle appears on the Australian Coat of Arms. For more information about wattle click here . A run of cold nights has brought out some brilliant autumn colour in my garden. 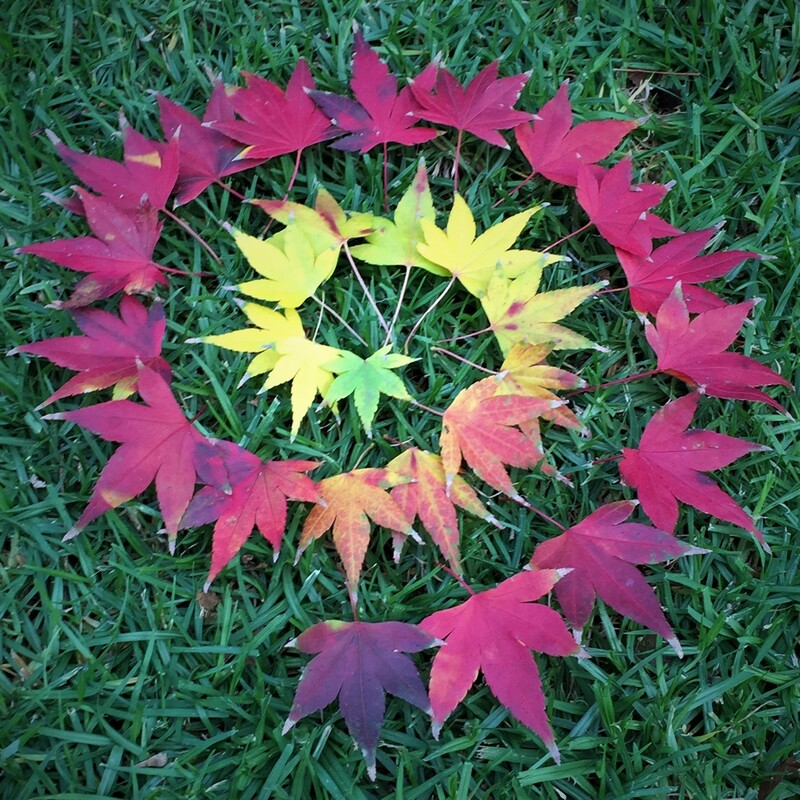 My Japanese maple is looking spectacular, and the different shades inspired this pretty spiral. 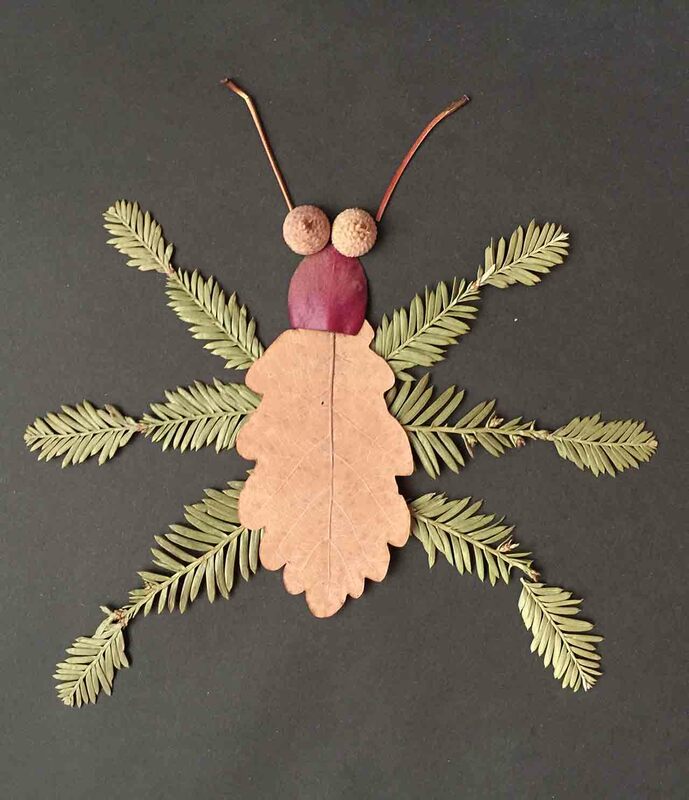 This type of nature craft, when laid out on the ground is sometimes called Land Art. It’s easy, satisfying, free and fun to do with kids! My new book has arrived! The cover features some of my favorite creations, some owls made from Liquidamber pods, with acorn cap eyes and Golden Rain tree wings. These materials are featured in the second half of the book, along with lots of other common plants, many of which are street trees found in cities around the world. The book is available now from Yourbooksonline and will gradually make its way to other retailers. 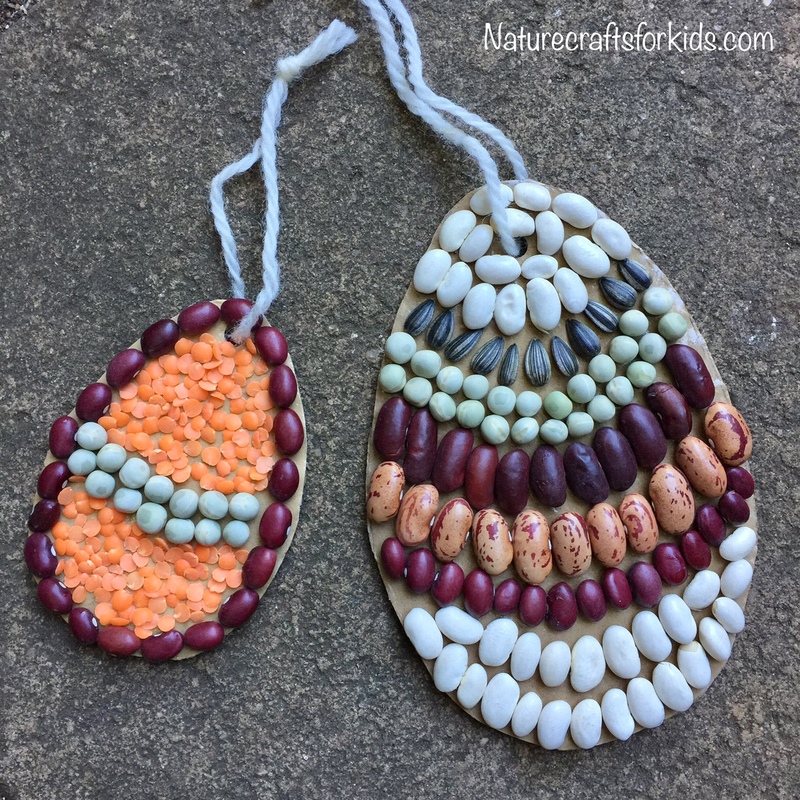 This nature craft is super easy, so great for a class of really young kids. 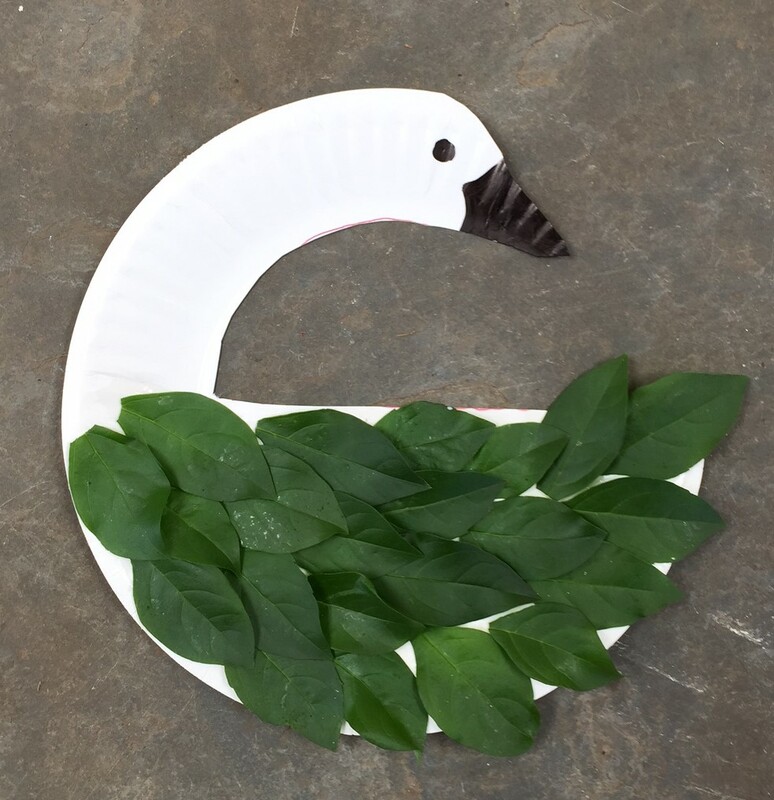 You can make a template of the swan shape for them to draw around, then cut out. Use a black texta to draw on an eye and colour in the beak. Glue on leaves for feathers, using whatever leaves you have around. Done! A sandy beach is the perfect canvas for some fun ephemeral land art. Use seaweed, shells, pebbles and any other bits and pieces you can find on the ground nearby. 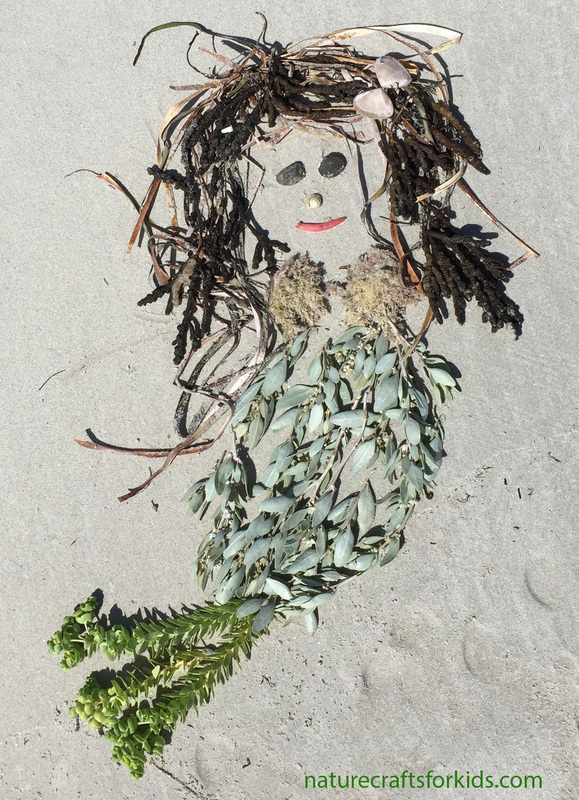 Create a mermaid or other sea creature. Take a photograph, then leave the pieces on the ground to be returned to the sea or for someone else to use. For more inspiration, see the work of Land Artists Richard Shillings and Andy Goldsworthy.